Logitech has announced Logitech Rally, a new conference cam that the company claim delivers studio-quality video, exceptional audio clarity, and an automated video conferencing experience that can be tailored to your meeting space. “Just a few years ago, a high quality video and audio system like Logitech Rally would have easily been a five-figure investment,” said Scott Wharton, vice president and general manager of the Logitech Video Collaboration. Rally features Ultra-HD 4K video, modular audio components, expansive PTZ capability, and Logitech RightSense technologies that automatically frame people, optimise colour and luminance for human faces, and improve vocal clarity for better meetings. Unlike traditional video conferencing systems, Rally separates the speakers from the microphones. These standalone microphones provide a superior audio experience and more effectively suppress noise and echo. Logitech say this modular approach makes Logitech Rally an ideal solution for meeting spaces of almost any size and shape. 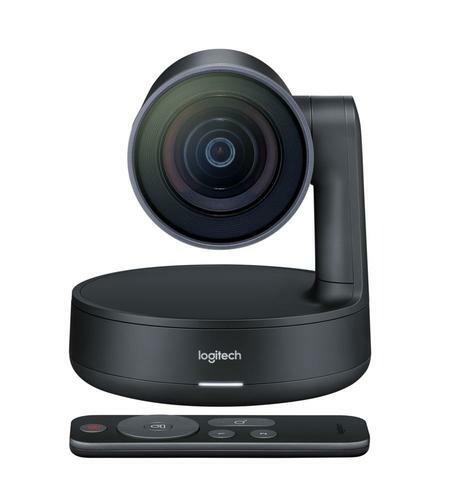 "Logitech has enjoyed great success with its affordable USB conference cams which work well in traditional meeting rooms and huddle spaces,” said Ira M. Weinstein, managing partner, Recon Research. "But until now, Logitech lacked a premium offering for larger spaces. The Rally portfolio gives Logitech the opportunity to move up-market and extend the reach of its conferencecam lineup. Based on what I’ve seen, Rally has the potential to be as disruptive as the earlier Logitech conferencecam solutions,” added Mr Wharton. Logitech Rally is compatible with almost any video conferencing service, such as Microsoft Skype for Business, Microsoft Teams, Google Hangouts Meet, Zoom, BlueJeans and more. The standalone Logitech Rally Camera will be available from late June for $1,999.95. The Logitech Rally system, which includes Rally Camera, plus table and display hubs that minimise cross-room cabling, one speaker and one mic pod, will be available in October for $3,599.95. The system can be expanded with additional Mic Pods, available in October for $529.95.